NEW YORK—It’s hard to think of a better fit than Sutton Foster for the role of Charity Hope Valentine, the eternal optimist and believer in happy endings. Foster shines in the role, coupling the character’s sunny attitude with a high-wattage smile, even as the world rains its woes upon her head. 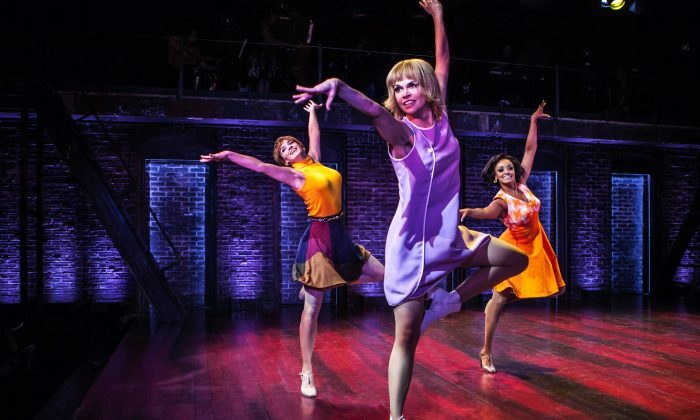 The New Group’s excellent presentation is of the 1966 Broadway musical “Sweet Charity,” created by luminaries like Neil Simon (book), Cy Coleman (music), and Dorothy Fields (lyrics), and was directed and choreographed by Bob Fosse. It was based on an original screenplay by Federico Fellini, Tullio Pinelli, and Ennio Flaiano. 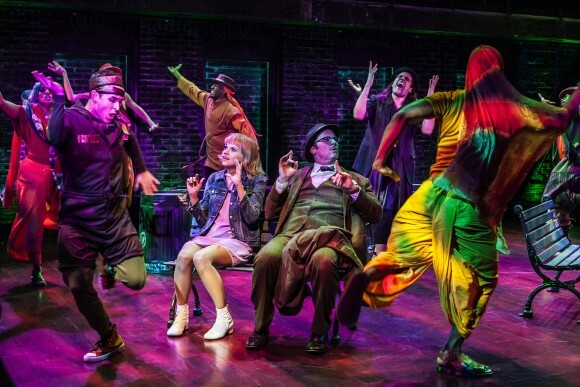 ‘Sweet Charity’ is an absolute triumph. It’s New York City in the 1960s and Charity works at the Fan-Dango Ballroom. There, men pay $6.50 for a half-hour dance. That sum does not include extracurricular business that might come up. As Charity makes perfectly clear, she intends to stay at Fan-Dango only for a short time—a period that has so far lasted eight years. Through it all, Charity has been an enabler to those she loves, even when they clearly don’t respect her. When her latest boyfriend ends their relationship by pushing her into a lake in Central Park, she refuses to accept the truth of what happened and instead makes excuses for him, as well as for the actions she herself took that led to this incident. Yet against all odds, Charity’s quest for a white knight to carry her away finally seems to be over. She first finds herself in a hotel suite with handsome Italian movie star Vittorio Vidal (Joel Perez), and later finds the possible man of her dreams in Oscar (Shuler Hensley). The buttoned-down nebbish of a tax accountant, Oscar, sees in Charity a kindred soul, one who, like himself, always looks for the pure and innocent qualities in others. As “Sweet Charity” makes clear, in order to find true happiness, you must first be able to love yourself and also know what you really want out of life. Vittorio clearly comprehends this truism. He plays up his movie star status in public but privately recognizes it to be a matter of image and glitz, which doesn’t hold a candle to true passion and friendship. Oscar also understands this idea. Too well, in fact, as it is one he tries to deny, to his own detriment. But this understanding is being something Charity hasn’t quite yet seen. Charity’s dreams for the future are shared by many of the Fan-Dango girls. Chief among them are her friends Nickie (Asmeret Ghebremichael) and Helene (Emily Padgett). However, despite their sometimes hopeful outlook, they are all brought down by the stark realities of their world. At the same time, they act as an extended family, supporting each other when they share their hopes and troubles. Thanks to the cast (many playing multiple roles), and the visions of director Leigh Silverman and choreographer Joshua Bergasse, the show’s score comes wonderfully to life. The sensual “Big Spender,” which introduces the audience to the Fan-Dango, is given a nice dose of cynicism to go with its sensuality; while “If My Friends Could See Me Now” literally jumps for joy as Foster shows Charity’s delight in finding herself so far removed from her own life. Another happy surprise is the comic “I’m the Bravest Individual,” which becomes a truly heartfelt and character-identifying song for both Charity and Oscar. Many of the musical numbers reveal a deeply felt humanity in the characters. This is particularly true in “I Love to Cry at Weddings,” a number led by Herman (Perez), owner of the Fan-Dango. Derek McLane’s set, basically a bare stage with strategically placed mirrors and props moved in and out when necessary, nicely captures the feeling of the era, particularly in the Fan-Dango scenes. This stripped-down version of the show also allows for exquisite dancing, which the entire company pulls off with aplomb. Clint Ramos’s costumes are also excellent, especially for the actresses. Foster is brilliant as the title character. Not only in the comedic moments—Charity stops the action of an entire scene to make a sandwich—but also in the dramatic ones. Charity’s attempt to tell Oscar what she does for a living is particularly poignant. Hensley does a good job with Oscar. A difficult role, the actor shows him to be a basically kind sort with his own emotional baggage. To find true happiness, you must first be able to love yourself. Also good among the cast are Perez as Vito and Herman (among others), and Ghebremichael and Padgett as Nikki and Helene. 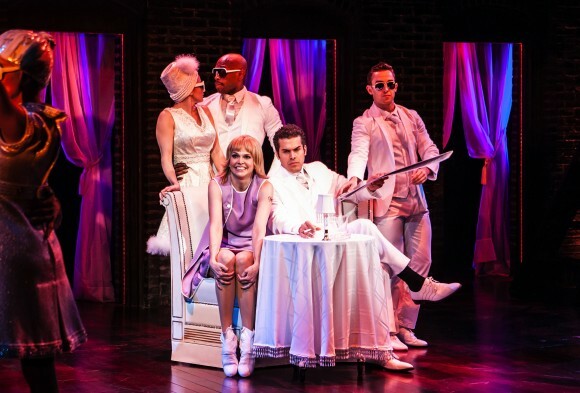 Working on every level, this production of “Sweet Charity” is an absolute triumph. Also in the cast are Yesenia Ayala, Darius Barnes, James Brown III, Sasha Hutchings, Donald Jones Jr., Nikka Graff Lanzarone, and Cody Williams.